Great grandparents down to toddlers will enjoy this fun activity day. oral history story is immortalized! 1. 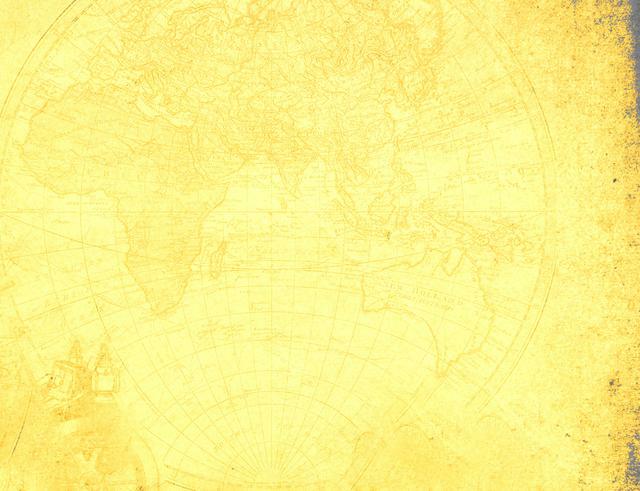 Underground Railroad Experience – (AJ/AG/SQ) The history of the Underground Railroad is filled with stories of danger, sacrifice, heroism, protest, community engagement, and ways people worked together for a common cause. This experience will give participants a sense of what it would be like to participate in this anti-slavery movement and the dangers associated with it. Using the period historical buildings and grounds, We've Known Rivers® will create a back-in-time experience using accurate historical interpretation and the power of dramatic storytelling. Visitors will be enthralled in the story and will experience history like never before. The Underground Railroad Experience will be a historical adventure that will give participants a new appreciation of Ohio History and teach them historical facts they will never forget. Step 200 years back in time at the 29thAnnual Fair at New Boston! Everything about this quality event creates the illusion of time travel to 1790 - 1810. Your full day of historical adventure will begin with cheering and huzzahs as Revolutionary War hero General George Rogers Clark rides into the Fair on horseback.Cannon fire will salute General Clark, Daniel Boone, and other heroes of the frontier, as they are formally welcomed at Opening Ceremonies. After the 15 star flag is raised over the Fair ground, stay around to hear food vendors brag about the quality of their delicacies and merchants urge the Fairmasters to stop by their booths. Fairgoers will have a hard time deciding where to go next. There is so much to do!! A wagon ride through the fairground is the perfect way to get a quick overview. There is so much to see! Explore the marketplace and unique shops that surround the public square. Find special treasures you will not find in regular stores. Pottery, herbs, dried flowers, handmade chairs, silhouettes, jewelry, books, lanterns, material, clothing of the frontier era and much more can be found in the tents and booths of more than three dozen merchants and artisans.The tinsmith will be making lanterns, while the blacksmiths work on the necessary tools needed by everyone. The lace maker will be making lace while he tells of his need to hire children as indentured servants. Need to rest your feet? Join the audience and share in the hearty laughter at the Cheapside Theater area. Can Dr. Balthasar’s elixir really cure all that ails you? What will Mr. Bailey, the Magician, pull out of his hat next? Can Professor Thompson S. Gunn really lie down on a bed of nails? This year an 18th century play will be presented at noon both days.“The Guardian” is sure to entertain today’s visitors as it did Fair visitors 200 years ago. Entertainment can be found throughout the Fair. Let the Clockwork Clowns amaze you.The beautiful Slackrope Walker and cheery Fair Wynds have captivated visitors for years.Puppet shows, singers, and magicians set up in various locations and sometimes move around. There is even a bigger variety of food available this year, so do come hungry to the Fair!Pork chops, turkey legs, sausages, buffalo meat, chicken and noodles, bean soup, corn, peaches and pound cake, raspberries and cream, creampuffs, bread and butter, green beans and potatoes, and much more will delight even the pickiest eaters. After stuffing yourself, take a short walk down a forest trail to visit a Woodlands Indian Village of the time period. This is particularly appropriate since the Fair is on the former site of two Shawnee villages Peckuwe and Kispoko. Handicrafts, games, and demonstrations of Shawnee, Mingo, Miami, Wyandotte, and other tribes are featured. At various times during the day, Gen. Clark, Daniel Boone, and other persons from the frontier will meet at the Fairmasters tent to tell about the Battle of Peckuwe, and other things that happened in this area.A professional actor will portray each of the visiting frontier heroes. Mel Hankala, from Kentucky Chautauqua will be Gen. George Rogers Clark. Daniel Boone will be portrayed by Steven Caudill, who has portrayed Boone on film. Bob Anderson, as descendant of a member of the Lewis and Clark Expedition will portray his ancestor Private Shannon. Eva Lail will tell of her time in captivity with the Shawnee. Phillis Wheately will read her poetry.Having a photo taken with at least one of these frontier heroes will be a must! Later in the Fairmasters tent the Liberty Dancers will demonstrate dances of the time period enjoyed by Washington, Jefferson, Clark and many of the founding fathers and mothers.Visitors will be given an opportunity to join in an 18th century dance. Music was enjoyed in many different forms then as it is now. Relax in a colonial tavern while listening to music of the colonial era. Musicians playing violins, mandolins, guitars, and even bagpipes move from tavern to tavern. The coffeehouse is as center of entertainment and a quiet place where you can enjoy a game of checkers or chess. Thrill to the boom of the full-sized Revolutionary War cannon. The Mad River Light Artillery sets up there bronze British Light Weight Six-pounder at the top of the hill near the flagpole and militia encampment. This group will demonstrate cannon firing many times throughout the day. Each afternoon features the excitement of a battle reenactment! The Fairs of the 1790 – 1810 time period sometimes featured reenactments of famous battles.The reenactment features militia on foot and on horses, cannons, Shawnee warriors, and British troops. It always promises to be exciting. There is time after the battle to finish shopping, get something to eat and catch another of the entertainers. Be sure to see the closing ceremonies at the end of the day. There is so much to do at the Fair at New Boston, that most visitors want to come back for a second day.As Saturday’s visitors depart they will find that discount return tickets will be available at the gate. Why is the Fair at New Boston recognized as a premiere living history event? All the music, entertainment, clothing, methods of cooking, foods served, merchandise booths, and equipment used by the artisans are juried (or judged) to assure authenticity to the period.It is also special because it is held on an actual historic site.The site of the Battle of Peckuwe and the Shawnee villages of Peckuwe and Kispoko and later the town of New Boston. All are now gone and are replaced by George Rogers Clark Park. Admission is $8 for adults, $3 for children aged 6-11, and ages 5 and under are admitted free. Admission for military active duty is $5 with ID.No pets please. Parking is free and plentiful. 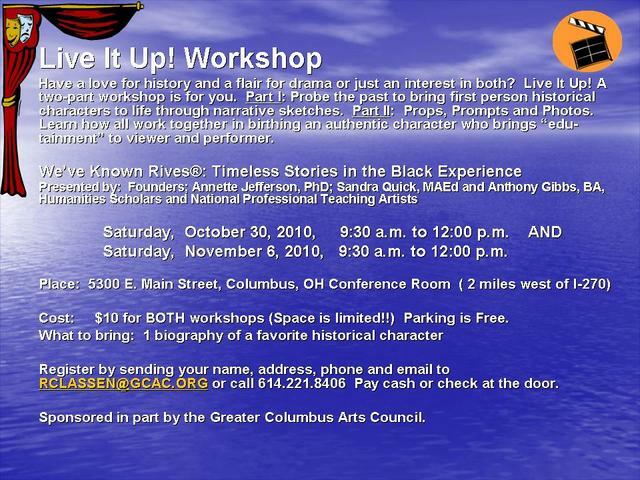 For further information call 937-882-9216 or email info@grcha.org. The Ohio Statehouse is more than a monument to our past; it’s where history happens. The 150 year old building serves as both a place of learning and the state’s working seat of government. Visitors to the Statehouse can experience Ohio’s rich history and witness the making of history through the modern lawmaking process. We hope to see you at the People’s House very soon! 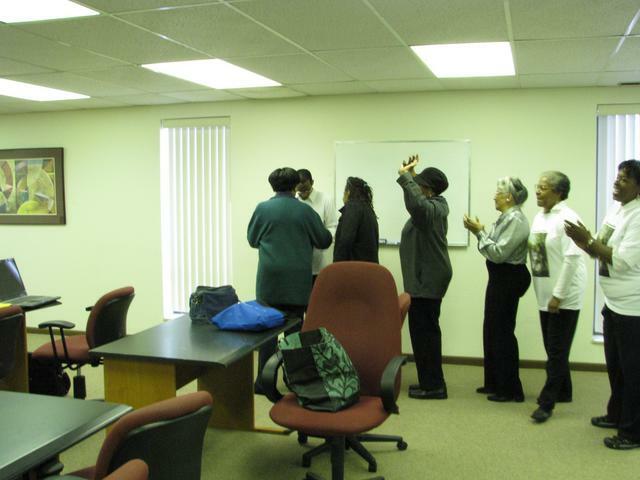 Ohio Humanites Council in 2010. Capital University was doing a video production and held character interviews of the We've Known Rivers character cast which included Annette Jefferson as Sojourner Truth, Anthony Gibbs as a Tuskegee Airman and Sandra Quick as Phillis Wheatley. August 2011 marked and celebrated the 11th, biennial, National Black Theatre Festival (NBTF). Nationally accepted as the Black Theatre Holy Ground, Winston-Salem, NC hosts this highly acclaimed week long festival which attracts over 65,000 people. In 1989, Larry Leon Hamlin, founder of the North Carolina Black Repertory Company had a dream. He wanted a national festival that would acknowledge both the power of black theatre and the amazing abilities and talents of black theatre professionals. Twenty-two years later, his dream has become a highly anticipated (and treasured) reality. Mr. Hamlin passed away in 2007. The terms "Black Theatre Holy Ground" and "Marvtastic" come directly from Mr. Hamlin and lovingly describe his dream and this amazing festival. TThe Northwest Franklin County Historical Society and Museum was incorporated November 11, 1966. The society's main objective was to create a historical village and museum which would preserve the early pioneer life of the community of Hilliards, Ohio, and the northwest section of Franklin County. The society was given a lease of a part of Weaver Park on which to build a museum and establish a historical village.he Northwest Franklin County Historical Society and Museum was incorporated November 11, 1966. The society's main objective was to create a historical village and museum which would preserve the early pioneer life of the community of Hilliards, Ohio, and the northwest section of Franklin County. The society was given a lease of a part of Weaver Park on which to build a museum and establish a historical village. Prices are negotiable for non-profit organizations. Visit the PBS website for African American History for interesting facts and information on well known and lesser known African Americans. In addition, Sandra facilitates FUN shops to help families commemorate their ancestors. Preserving legacies, memories and accomplishments at the next family reunion, holiday gathering or part of a celebration of life assures they will be remembered forever. Some of the FUN shops include: creating time capsules, constructing treasure chests, designing memory books, multi-generational genealogy trees, producing “remember when” cards, or preserving great-grandma’s delicious recipes. If folks really want to get into first person storytelling, then come to Living History: It’s About Time. 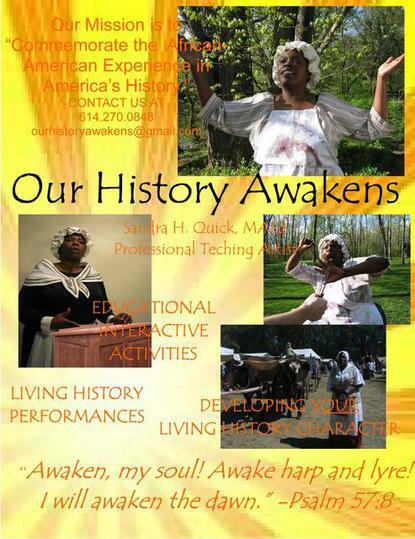 Sandra helps awaken creative spirits by helping you bring a historical character to life. Another option is hosting an 18th century Ladies High Tea Party. Sandra arrives from the year 1777, in high style, to share the life of Phillis Wheatley, the first black slave and female to have a volume of poetry published in the American colonies.